We receive enquiries weekly as to whether we sell scented beeswax candles. We don’t… for a couple of reasons. 1. 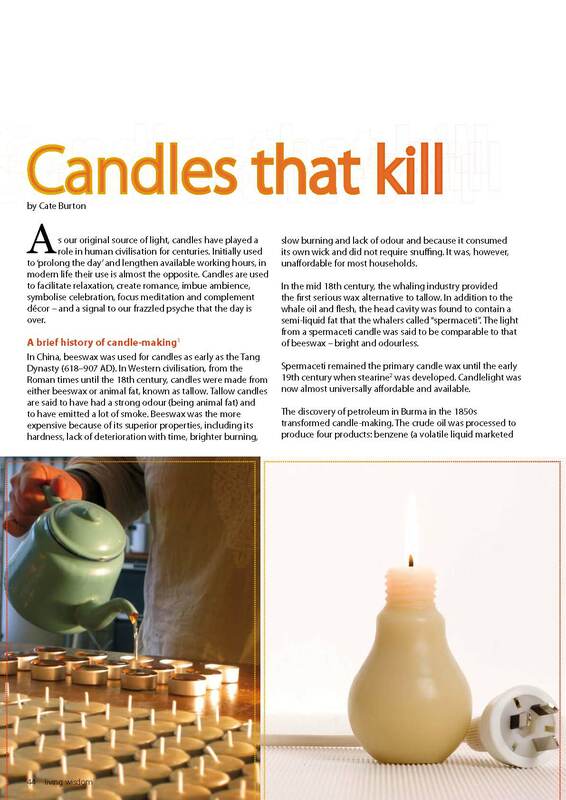 The vast majority of candles are scented with ‘fragrant’ oils (fragrances, aroma oils, aromatic oils etc). Fragrances are synthetic chemicals. Clearly this would not be consistent with Queen B candles. More on this in a moment. oils may contain potential carcinogens, such as polycyclicaromatic hydrocarbons. Of course it is perfectly safe for you to put drops of oil in water (or wax) and to vapourise the oil (through heating), as in the case of using an oil burner. That is fine because the oil isn’t being combusted. So, back to fragrances. I am sure that many of you, even though fans of Queen B, may have a fragranced candle lying around that you just can’t get rid of because you love the smell so much? If so, read on. A quick read of the entire 44 page report (you can find it here) should cure you of any desire to burn fragranced candles (or wear perfume for that matter). Interestingly when I looked into who regulated fragrances in Australia, I found out about NICNAS (National Industrial Chemicals Notification and Assessment Scheme). NICNAS requires all importers and/or manufacturers of industrial chemicals for commercial purposes to register with NICNAS. Interesting. I did a quick search on a couple of well known manufacturers of ‘natural’ soy wax candles that I know to be using fragrance oils and the largest of them showed up as being registered with NICNAS. In the interests of keeping this post to a reasonable length I offer the simple observation that it appears that the EU have a significantly better & more restrictive system for regulating industrial chemicals than Australia does. By all means, have a beautifully scented house… by using pure essential oils in an oil burner with a Queen B tealight below. Or if you prefer you can just enjoy the natural, light honey aroma of a Queen B candle – just as nature intended.